Most glass reptile cages are structurally identical to fish tanks--in fact, manufacturers frequently sell identical products as both aquariums and terrariums. 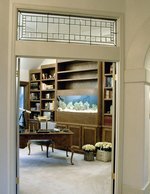 With adequate time, preparation and equipment, an average pet enthusiast can easily convert a former reptile cage into a fully functional, fish-friendly aquarium. However, the process can have catastrophic effects-- including massive fish die-off and tank leaks--if it is not approached correctly. Verify that the tank can hold a substantial amount of water. Look at the bottom of the tank for a tag or manufacturer's label; this should state the type of container (aquarium, terrarium or both). If you are unable to find this label, contact the manufacturer for more advice. Do not put water in a tank that is designed only as a dry habitat for reptiles. Remove all substrate, gravel, rocks, ornaments, wood and food from the tank. Discard them or place them in another reptile-friendly glass cage. These harbor nutrients, ammonia, fungi, bacteria and other compounds that can upset the chemical balance of an aquarium. Clean the terrarium very thoroughly using a nontoxic, biodegradable cleaning product. Excellent options include vinegar, Greenworks glass cleaner or baking soda. Be sure to scrub the seals and corners of the tank, which are most likely to harbor harmful compounds. Rinse the tank with water. Place the aquarium on a stand that is graded to accept a significant amount of weight--specialized aquarium stands are ideal. Keep in mind that water weighs nearly 9 pounds per gallon and that most tables can not withstand the weight of a fully-loaded fish tank. Add all of the optional decorations and ornaments for the aquarium, like gravel, decorative rocks and live plants. Fill the tank with water and immediately add an appropriate amount of liquid dechlorinator to detoxify the water. Set up a filter and hood that are designed to fit the dimensions and water capacity of the tank. Carefully plug them into an electrical outlet. If you will be keeping tropical fish, you might also need a heater. Test the water daily using nitrate and ammonia test strips. These compounds are toxic to fish, and they are likely to be found in an aquarium that was previously used to house reptiles. If the test strips reveal that the water contains nitrate or ammonia, it means that there is still some reptile urine in the aquarium. Perform 50 percent water changes daily until they are undetectable, then begin adding fish to the tank.